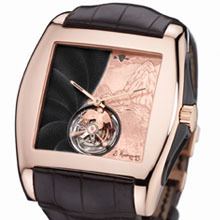 Hours and minutes, flying Tourbillon at 6h, square case with generous proportions, prestigious finishes, handmade decorations and engravings; here there is a watch which we can admire in every detail as it was created with a transparent case back. 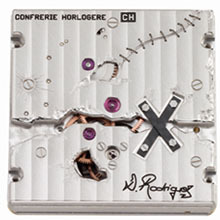 “Résilience” is the name of David Rodriguez’ piece for the Haut de Gamme brand Confrérie Horlogère. Through very peculiar decorative details it summarises an entire life: intense and difficult existence of David Rodriguez, born in Peru, abandoned at birth, maltreated, condemned to walk with crutches after poliomyelitis contracted in his early childhood. A course of life full of obstacles, with an emergency exit in Switzerland, a country where David had found a loving, adoptive family. At present, the bad fate baiting him seems to have worn out. David has a passionate enthralling job and is surrounded by his family, a wife and their three little girls who are the sunshine of his life. The watch “Résilience” reflects well the will to resist suffering and the capacity to survive, gaining strength despite the obstacles which mark the life of humans. To start with, this aptitude is expressed by the case designed in only one, resolutely imposing size. Then by the face “dissected” in two, offering, on one side, a guilloché pattern in black - sober and mysterious at the same time - and, on the other side, a delicate handmade engraving reproducing Machu Picchu, en archaeological Inca site and inheritance of humanity considered as one of the New Seven Wonders of the World. Finally by its movement visible through the transparent case back and which, in a surprising way, reveals a tortured world made of wounds and scars, fractures and stitches. The suffering endured by the creator of this piece is revived through numerous symbols: an X in carbon fibre (a material thanks to which David’s legs can support the weight of his body, thus enabling him to hold upright) which repairs the open fault symbolizing the disease which broke his childhood, a scar mended with a golden thread and decorating the upper part of the bridge, the holes and cracks gashing the classical “Côtes de Genève” décor that seem to compromise the work of a good watchmaker. Nevertheless, the result is contrary to the expectations. Just like the life of David Rodriguez has taken its unhoped-for revenge being the fruit of an undeniable interior force, the “Résilience”, despite the fractures and stitches decorating its bridges, offers a sophisticated and precise mechanism of high degree of accuracy. The indication of the hour and the minute are at the centre, the flying Tourbillon at 6 h includes a Swiss lever escapements and is characterized by a construction allowing the carriage to rotate in one minute without resorting to ball bearings, the Power Reserve is of 5 days. It is also necessary to highlight the bridge of the cage which represents the Andean Condor and is handmade. In South American mythology, the condor symbolizes the respect due to the people. A multitude of details retrace the joys and sad experiences of this out-of-ordinary life out and, at the same time, they represent a key which makes it possible to give a direction to the existence of each man and each woman: the suffering and happiness seem to be inevitably connected… In any event, the final result will be harmonious and fascinating, just as this surprising watch which beats at the rate of 21’600 alternations per hour. Entirely made in Switzerland, David Rodriguez’s watch benefits from the lifetime warranty specific to all pieces signed by Confrérie Horlogère.